Outbound telesales is a process full of waste, poor design and variation that is ripe for the application of improvement tools. Not only can process quality be improved, but also revenue can be increased. Part One of this two-part article addresses the types of waste that may exist in an outbound telesales operation and how to begin resolving those wastes. Part Two of the article looks at agent-assisted automation and paths to higher conversion rates. The way to address non-value added (NVA) activities is to 1) eliminate them, 2) reduce the steps/time it takes to complete them or 3) find a way to get them done less expensively. The key technology for accomplishing all of these things is agent-assisted automation. As implied by the name, this is a technological solution that automates the work of an agent in terms of 1) specific conversation tools and 2) computer assistance. In telesales, agent-assisted automation can address two huge sources of extra motion waste: wrong numbers and answering machines. Pre-recorded audio and pre-programmed system actions allow agents to politely end calls, update their system and signal to the dialer they are ready for their next call – all with a couple of key strokes. Agent-assisted automation can do the same with an answering machine – leave a message (instead of simply hanging up), update the internal system and case notes to plan the next call to that prospect, and signal the dialer the agent is ready for the next call, again all in parallel. Shaving 15 to 30+ seconds on every call adds up to more time spent on value-added activities, which is an immediate productivity lift. The next two big areas of muda (or waste) are process defects and waiting. Telesales calls are fairly scripted, meaning they do not branch in dozens of different directions. There is some kind of greeting, perhaps some kind of verification, a pitch of some kind, a few ways to handle “no’s,” a close to the pitch and a way to end the call. That whole process, including updating systems and case notes (but with the exception of closing an interested qualified customer) can be completely executed with pre-recorded audio. These steps straight out of a Process Improvement 101 class (eliminating and streamlining non value-added work and driving out agent variation) would already make an outbound group 10 percent to 15 percent more productive. And we have barely scratched the surface. As with the reduction of inventory in a factory, the elimination and streamlining of the NVA has drained the swamp and by so doing revealed that there are primarily two processes involved with telesales work. There is a lot of pounding through numbers and administrative work and a basic pitch to identify qualified and interested buyers, and there is “the closing.” The former requires virtually no real skill, while the latter requires the agent to be enthusiastic, well spoken and accent-free. This suggests that there is a natural and potentially productive division of labor; in fact, there is. There is a British expression, “horses for courses,” which means that different people are suited for different things and it is important to get people doing work that is aligned with their skill sets. By splitting the agent role into a Tier I admin group that is pounding through phone numbers to get prospects on the line and a Tier II group of closers, there are now two different hiring profiles. The first group, using the pre-recorded audio provided by the agent-assisted automation, do all the dialing, waiting, leaving messages, dealing with wrong numbers, etc. When a prospect expresses some interest, the Tier I agent transfers the customer to a Tier II agent with a few button presses. Tier I agents almost never even speak with a customer. Some agents even turn their microphones off. The Tier II team is the closer group. This is a job with a higher skillset requirement. The agents need to be enthusiastic, have the ability to connect with people, be well spoken, know how to deal with rejection, etc. They are harder to find and must be paid greater compensation. The good news is that a company does not need as many of them as they are only taking the qualified calls being handed off by Tier I agents. The news gets better. Though the Tier I work has been streamlined, there is still a lot of waiting time (dialer delays, phones ringing, etc.). As a result, most Tier I agents find they can easily handle two calls at once and some can handle up to three! As the calls are in different phases, the basic interchange with the customer is often very straightforward. Even though it is a cacophony of voices in their headsets, the agents do not seem to have any trouble handling it. In fact, if a company is deploying a kind of piece-rate compensation system, the agents are motivated and grateful to be able to handle multiple calls. The productivity gains from this Tier I to Tier II change are incredibly multifaceted. One agent handling three conversations is a big productivity gain (Figure 1). Tier I agents are easy to source. It is a low-cost, entry-level job; since the agents’ microphones are often muted, it can be offshored for additional labor savings. Training is also reduced since most of what needs to be done is baked directly into the automation. The Tier I monitoring costs and off-phone coaching time are dramatically reduced (or can be redirected to Tier II) because the agents are not speaking, the process does not vary that much and the automation is always correct. Finally, though it is too soon to have collected data on this, the redesign of the process and use of automation shows signs of addressing the muri (unreasonable demands) associated with telesales work. It thus has the potential to reduce turnover and all the costs and corrosive effects on performance from that turnover. This requires a bit more explanation. Outbound telesales agents love agent-assisted automation. The Tier I agents using pre-recorded audio for qualifying the prospect do not feel bad when the hang-ups and curses inevitably come. Agents report that it does not feel personal; the customer is not saying “no” to the agent, the customer is saying “no” to the software. Further, the agents do not get yelled at because of their accents, they do not get as fatigued because they do not have to talk at all and they make more money because of the piece-rate incentives. Agent satisfaction measures soar. Also, higher-priced Tier II closers are experiencing fewer “no’s” or customer belligerence because the agents are only being handed calls in which the potential customer has shown some interest. NVA activities have been virtually eliminated. Tier II closers are selling on every call and their conversion rates go up (and their pay goes up, too, if compensation is variable). Job satisfaction increases in this group as well. It is unlikely that anyone will ever make a career out of making outbound telesales, but even small extensions in agent tenure can improve center-wide performance metrics and reduce the human resources costs associated with turnover. There are two conversion rates of interest: the conversion of someone who answers the phone and is led to be an interested prospect (the Tier I agent pitch and counters to the customers’ initial hesitance), and the conversion of a prospect to a customer (the Tier II pitch and counters). Analyzing and managing existing variation and doing controlled experiments are the key Six Sigma tools for improving conversion rates. Generally speaking, the first step for improving either conversion rate begins with graphing the agents on a p-chart (see Figure 2 below). At this point, the goal is to identify agents that are statistically better at successful pitches and counter practices. For the Tier 1 agents who are using a predefined process and pre-recorded audio, there are fewer statistical differences among the agents. There are agents that are converting less due to burning through too many numbers in an attempt to raise their piece rate, but this is rare. Limited-to-no between-agent Tier I differences (due to the automation) is the bad news. The good news is the fact that the Tier 1 pitch is completely automated – experimenting with different pitches is a snap. It is possible to run as many different pitch variations 1) as there are hypotheses about variables that affect the success of the pitch and 2) as there are agents to run sound experimental designs. Not only is the pitch something to experiment with, but the recorded voice is a variable that can also be tested. Some voices convert better than others. One company found that a women’s voice with a slight Hispanic accent converted better than all the others; they went with that for all agents. Moreover, each agent running multiple machines enables an improvement team to run better experimental designs with more power. Rather than run a randomized block design with half the agents running one pitch and half running the other, a completely randomized design can be run with agents running the two pitches on their machines. It is a better design with an extra degree of freedom (no blocking factor), enabling the detection of smaller differences. As for improving the Tier II conversion rate, since these agents are not using automation, graphing them on a p-chart will likely yield agents that are statistically better. Although as the Tier II group is smaller, there may not be enough agents to show such a difference. Why is Sally converting at a higher rate than Jane? Is it Sally’s voice? Her empathy? Is there something in how she pitches and rebuts the initial “no” or is it her tenacity? Be sure to use statistics to identify real differences and not just eyeball reasons why Sally outperforms Jane. Treating noise as a signal is a surefire way to develop superstitious (unproven) behavior and take “improvement” actions that actually make things worse. The p-charts of agent performance will also enable company managers to get better at hiring and training as well as performance management. What is it about Sally’s approach? Can that attribute be hired for? Can other agents be trained and coached to follow Sally’s approach? Jane’s data looks worse, but is her performance statistically different than the rest? It is desirable to manage out those whose conversion rates are statistically worse, as shown in Figure 2. Becoming better at 1) identifying the best attributes to achieve the desire performance and selecting new hires based on those differentiating attributes, 2) training and cross-pollinating best practices, and 3) managing out those whose performance is statistically worse are great approaches for continuously lifting center-wide conversion rates. Companies know how to cut costs, but all companies continue to look for ways to drive revenue growth. Pick Six Sigma projects targeted at increasing revenue to garner management’s undivided attention. Adsit, D. & Bobrow, W. (2007) “Take the Guesswork and Gamble Out of Hiring Call Center Employees.” Call Center Magazine. Deming, W. E. (1982) Out of the Crisis. The MIT Press. Madrigal, A. (2013). “Almost Human: The Surreal Cyborg Future of Telemarketing.” The Atlantic. Part One of the article addresses the types of waste that may exist in an outbound telesales operation and how to begin resolving those wastes. 1. You used a p-chart inappropriately. 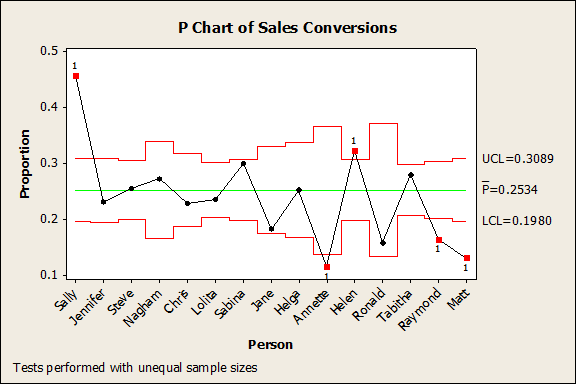 P-charts like all control charts are a tool meant to see if a process is changing over time–not categories. A more appropriate analysis tool is a chi-squared analysis for looking for differences among conversion of sales by your Tier 2 agents. 2. You mentioned agents need to be accent free. Really? I take that comment as either racist or you’ve never moved outside of the MidWest USA which is known to have the flattest “accent” in the states. Most everyone has some type of accent and I found the comment inappropriate. 3. Telesales must be a challenge but I wonder if there’s real data showing a higher conversion by folks who hear an automated or highly nuanced automated system when they answer versus a human. Fascinating article and perspective.